Vivint Solar have partnered with Mercedes-Benz to provide a new line of PV solar + storage solutions for residential homes – and they’ll be bringing the Mercedes-Benz Energy Storage to California for some test trials in Q2 2017. Vivint Solar already have an existing home solar panel business (they’ve installed over 100,000 solar systems in the US), and Mercedes Benz (under Mercedes Benz Energy) will be providing the technology for the battery storage. This tech is currently in use for their electric and hybrid vehicles. The battery systems will be modular, with the 2.5kWh cells able to be daisy chained up to a huge 20kWh. They also employ Mercedes Benz’ patented style and look fantastic. Personally we’re more interested in their performance but the slick design is definitely going to be a decent rival to the Tesla Powerwall 2 for the buyers focused on aesthetics as well as performance. The battery will retail from USD$5000 for a 2.5kWh system (installed) up to around $USD13,000 for a 20kWh system. 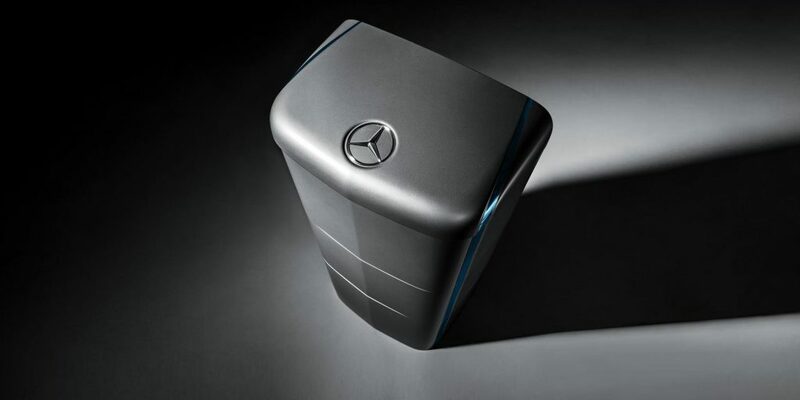 Click here to visit the Vivint site and learn more about Mercedes-Benz Energy Storage. With regards to their vision for Mercedes-Benz energy storage in other markets, Head of Development Electrics Harald Kröger said “We can count on the support of expert partners for our sales of the Mercedes-Benz energy storage units. The ideal contact for the end customer is their local electrical specialist.” This should give some indication as to their plans for expansion in the future and how they will manage strategic partnerships. The system has a 15 year warranty on parts with a 10 year current value replacement guarantee. Estimated battery lifetime is rated at 8000 cycles (charge / discharge) and about 90% of the specified capacity (about the same as the Powerwall 2) will be usable. Expected residual capacity after 10 years is cited at >80%, while the Powerwall 2 is estimated to only hold 70% by this time. The batteries can either be wall or stand mounted. The batteries will be coming to California in Q2 2017 – to begin with they’ll only be available for new Vivant customers but according to the site they will be ‘expanding soon’ and you’re able to add your name to the waitlist at the bottom of this page. According to EnergyMatters MB are said to be in talks with a local energy supplier with regards to an Australian release (as Vivint don’t have an Australian presence they will have to go with a different supplier). They’ve already launched in the UK and have small networks of installers in Belgium, the Netherlands, and Austria. We’ll update you as soon as any information is available!